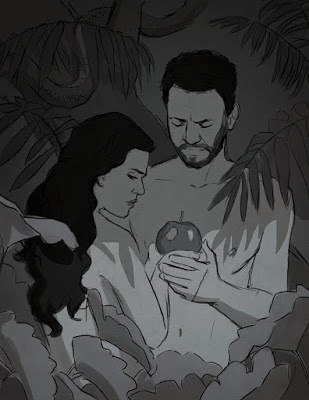 It's not often that my assignments for Lifeway's Explore the Bible series give me a chance to draw naked people. In fact, my first rough sketch of this scene, according to the client, was too revealing! They asked for more foliage to cover them up. Whenever I start an illustration, I try to identify the main emotion I want to convey. In this case, that emotion was guilt. So, I used some composition and color tools to reinforce this emotion. Zooming in on the couple helped focus on their facial expressions. 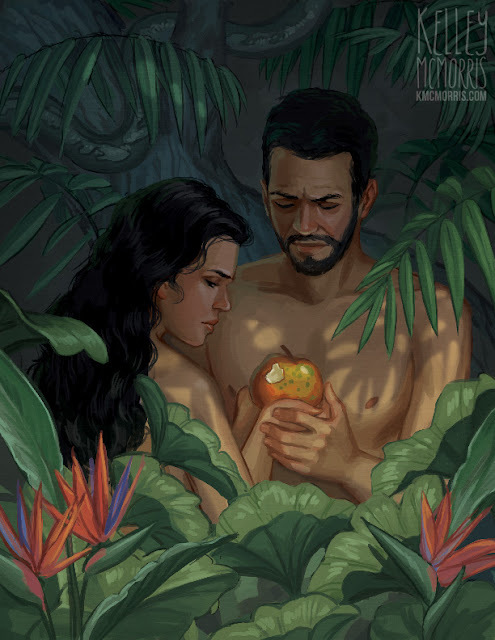 The shadow cast over Adam and Eve is not only symbolic, but also helps make them look like they're hiding. Having Eve looking over her shoulder was not only convenient for modesty reasons, but also made her look furtive and evasive, like she can't even look Adam in the face. But my favorite detail is the snake in the top corner. Did you catch it? Hi! I'm @fluffypaws007! I've seen you on Storybird! I didn't know you were Christian, too! This is amazing artwork; I did capture the hidden snake.